Red Beauty Bergenia, which is also known as 'Pigsqueak' is a mounding evergreen perennial that has thick glossy green leaves which take on a deep red coloring in the fall as it gets colder. From spring through early summer, carmine-red flowers will rise on taller stems above the plant. It will grow to a height of 12" to 15" and just as wide. Red Beauty Bergenia likes to be planted in light shade to full shade. Use this plant as a groundcover. in a rock garden, woodland garden, as a filler in a perennial bed, or as a grouping in a landscape bed. The flowers of Red Beauty Bergenia will attract butterflies. It is also deer resistant. Divide in spring every 3 to 4 years or so when the clump opens up in center. 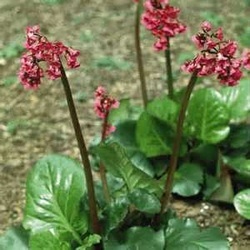 Red Beauty Bergenia will tolerate wet soil making this a good choice for along streams, ponds, or wet areas. It is also a Firewise plant.